This is the only item in the base game that causes negative effects on the player. Dragonborn adds three more, Ahzidal's Gauntlets of Warding, Ahzidal's Helm of Vision, and Ring of Bloodlust. Wuunferth describes it as an exquisite eight-sided amulet with a jade skull emblazoned upon it. While it has a jade skull, it does not appear to have any sides, but is round. The version of the amulet that appeared in Oblivion had six sides, while those that appeared in Morrowind and Daggerfall were also round. 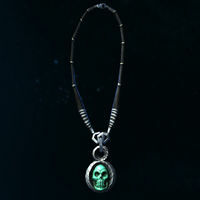 The Necromancer Amulet has appeared in multiple Elder Scrolls games. Information about the history of the item can be found on the lore page. Selling Calixto the Strange Amulet is the only way to turn it into the Necromancer's Amulet. If you reject his offer, the strange amulet will remain a quest item, leaving it permanently assigned to your inventory. This issue has been addressed by version 1.0 of the Unofficial Skyrim Patch; it replaces the Strange Amulet with the Necromancer's Amulet. It is possible that the dialogue where Calixto offers to buy the Amulet does not appear. It is possible to obtain unlimited gold by pickpocketing and re-selling the Strange Amulet to Calixto. This bug is fixed by version 3.0.5 of the Unofficial Skyrim Legendary Edition Patch. This page was last modified on 16 February 2019, at 21:29.